Latest Project - a 1966 160 Monza that's getting converted to bodywork I find a bit more appealing. Project has stalled lately though... but it'll get done eventually. Well after being stalled for many moons, I'm finally getting back to work on this little beastie. Making progress. Now I need to start looking for a pinstriper who can smooth out my shakey lines... I want to have the line where the color splits done on gold. I'm wondering if maybe I should have done the tank in silver and the swoosh in black??? Too late. It's staying this way now. I put off painting the tank for over a year, I'm not going to redo it at this point! The headlight is silver too... I may need to rethink that. Once it gets further along in the rebuild up I can decide which way to go on that one. I have anohter shell I can paint black and decide which I like best. DesmoDog wrote: I'm wondering if maybe I should have done the tank in silver and the swoosh in black??? Too late. It's staying this way now. I put off painting the tank for over a year, I'm not going to redo it at this point! The paint scheme isn't changing... 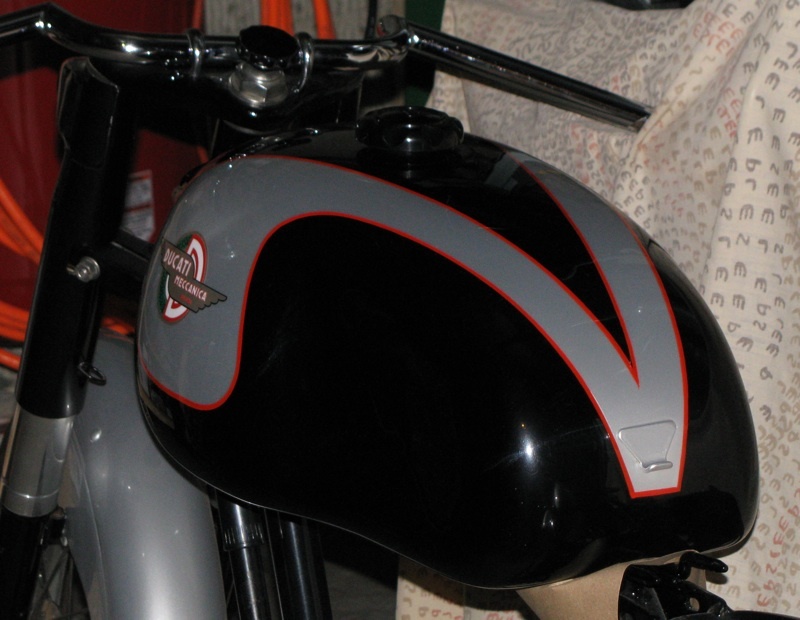 I looked at some old pics and figured out the scheme I chose mimics what Ducati did back in the day as far as what parts are which color... I KNEW I got the idea somewhere. Last edited by DesmoDog on Thu Oct 16, 2008 12:59 pm, edited 1 time in total. Far out man when you start something you sure dont hold back do you ? ps;why is that we all call our bikes , "she" as in she is a beauty ? I was playing around with stripes on a sample sheet and have decided on red. I dunno, looks more Italian or something? As for the tank... I had it almost done, then went to spray the "last" clearcoat. basically a flow coat. Major runs. I spent two hours fixing it last night and have another hour or two before I can try again. One of the many hassles of painting in a poorly lit, not very well set up "booth"! I'm getting enthused about this project again after having basically let it sit for over a year. Problem is I've got three other bike projects vying for time with it. The work stuff really gets in the way of a guy's hobbies! Ok, if you surf a lot of Ducati sites you've probably already seen these pics since I think I've put them on any site even remotely involving bikes, but I'm just that happy to FINALLY have the bodywork done on this little project. And that's it for the tank pictures, I promise. Now I'm working on rebuilding the seat. It's not hard to make a good looking '66 Monza. The first step is to replace all the Monza bits. Working on the seat now. I think I'm almost ready to have it recovered. Outstanding! What a great transformation from the squarish bodywork! I want to do that to my 66 Sebring. Where did you get the wheels/rims? Slarsonroy wrote: Outstanding! What a great transformation from the squarish bodywork! I want to do that to my 66 Sebring. Where did you get the wheels/rims? Thanks. The rims are some NOS San Remos off eBay. They aren't the ones you want though, they're 17". You want 18". If you like these wheels, what you want to do is get some flanged Excels and stainless spokes - I'm not sure if Steve carries those here or not? As for the squared off bodywork your bike has, I've seen bikes use it and it looks decent. Otherwise pretty much any other tank from a narrowcase can be made to work. 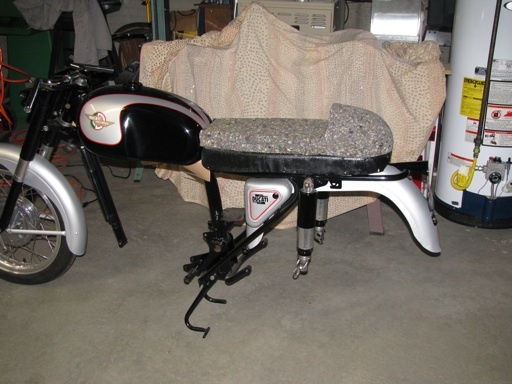 You may have to modify the seat or you can just use an aftermarket fiberglass one like most people do. 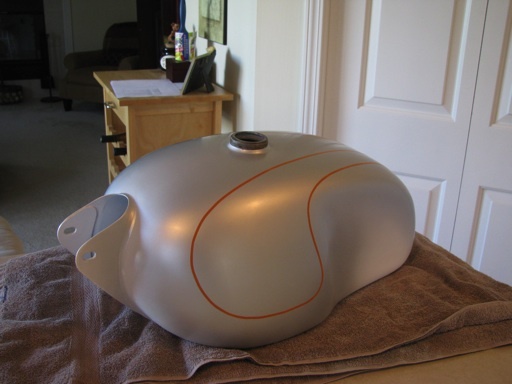 Airtech carries bodywork too, but I won't use a fiberglass tank on a streetbike. There are also some Benelli tanks that will work. You don't need sidecovers but if yo want them, eBay is your friend or repros of some designs are out there. I put a headlight on this thing last week and am picking up the seat tomorrow. I'm sure there will be updated pics soon. I'm also just getting started on a 350 myself. 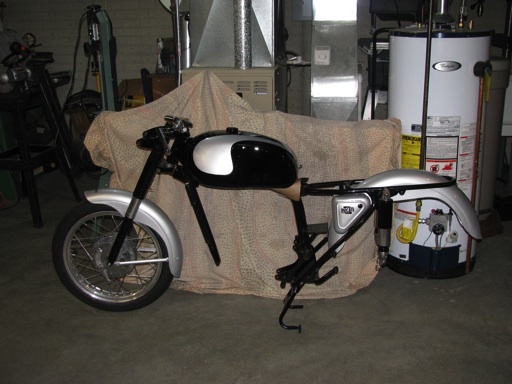 Started out as a 250 Monza but then it got a 350 Sebing engine, an Oldani replica front hub, some flanged alloy rims and I'm going from there... it's starting to take over my attentions so I'm hoping there will be a mock up of it done in a month or two... stay tuned. Got the seat done. I'm not in love with it (the hump is too massive) but it'll work for now. Adding the trim helped a lot. The back of the tank needs to be raised a bit and I'm considering trying to lower the back of the seat a touch too... but it can't move too far before it hits the fender. That is looking real nice!